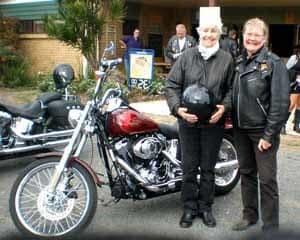 Put on a leather jacket and helmet and prepare for a 2 hour Harley Davidson motorcycle tour around Brisbane. This experience is for two passengers on two Harley Davidson bikes. Two Brisbane Harley Davidson Rides for the price of one! Please note that both rides must be booked and taken concurrently on the same day. Put on your leather jacket and helmet and prepare for a 2 hour Harley Davidson motorcycle tour from Brisbane into the surrounding countryside. You and your companion will go for a sensational ride out into the country passing rural towns and climbing mountains with fabulous views along the way. Get set for a double Harley Davidson motorbike blast! On the day of your experience we will pick you up from Southbank in Brisbane. Imagine the looks on the faces of your family and friends as two rumbling Harley Davidson’s arrive to take you and your partner for a two hour trip out into the countryside around Brisbane! Our Harley Davidson motorcycles are equipped with high backrests, comfy seats and running boards for your feet. You'll be riding with the best of the best, a registered tour operator with over 20 years' experience who is fully licensed with Queensland Transport. During your ride you will get to experience a range of different styles – from cruising down the freeway to taking corners on winding hilly roads and riding through quaint country towns. You’ll both be grinning with excitement for days and talking about this experience for years to come - life should be full of these experiences! Was a fantastic early Christmas present from my wife, The tour was fantastic, Libby & Peter was so helpful & friendly, loved being back on bikes, would recommend it to anyone. My mother and i had an amazing morning. Couldnt take the smile from my mums face. She tbougjt it was the best xmas present ever! Surprise Harley ride for my friends 60th B'day.. An Amazing experience for her thanks to Peter and Libby whom made her feel safe, comfortable and confident in her experience .. Great ride! Awesome people!! Thanks again guys :) Would definitely recommend to anyone!!!!! Do this adventure! You won't be dissapointed. Peter and Libby are extremely professional and genuinely nice! The choice of the ride course was excellent. The tour operators exhibited highly professional driving through out the tour. There is only one thing that I would change concerning the tour. The meeting place for the ride, The Ship Inn, South Brisbane, is a VERY DIFFICULT area to find parking. Me being from country Qld makes finding parking close be even more difficult. Perhaps meeting in an area away from the center of Brisbane. Thank you both again for the lovely day. My niece and I were very lucky that it turn out to be such a perfect day, a sunny warm day, where as the day before being such a wash out with all that torrential rain. You were right Pete. Thank you both again for such a good time. Libby and Peter were fabulous on the day. I would recommend them to anyone looking for a bike tour in and around brisbane. It's always easy to book with Adrenalin and there's a great variety of activities to choose from so I recommend it to others. The harley ride was spectacular!